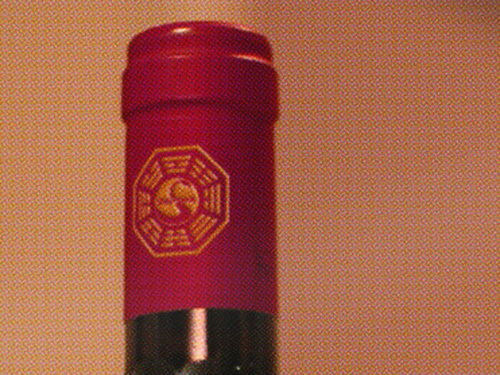 …for your DHARMA Initiative wine cellar. We know that the DHARMA Initiative keeps their personnel hale and hearty with a semi-steady supply of wines. Thus far on the show we’ve seen bottled Merlot and Cabernet and generic red wine in a box. Well, recently several more DI wines have come to light: Pinot Noir and Zinfandel in the reds, and Chardonnay, Chenin Blanc, Muscat, and Sauvignon Blanc in the whites. Sorry, no generic wine labels in this batch. Additionally, we came across an old DHARMA Initiative Wine ad from the ’70s—take a look at it at maxpixpix on Flickr. Now where did I store those Hydra Station wine glasses? This entry was posted on Thursday, July 16th, 2009 at 4:04 pm	and is filed under Film/Video, Food, Graphic Design. You can follow any responses to this entry through the RSS 2.0 feed. Responses are currently closed, but you can trackback from your own site.